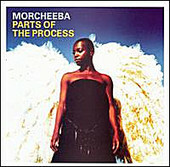 London's Morcheeba reflects on five albums and seven years with the 18-track retrospective Parts of the Process, a soulful, beautifully layered pop-flavored trip-hop record. Including two new cuts - "What's Your Name" (featuring Big Daddy Kane), with its big hip-hop slant, and album closer and "Can't Stand It", an airy, orchestrated pop offering. Parts of the Process is a fine introduction to the band, and a solid reminder of the band's strongholds for longtime fans. From soaring hooks to danceable beats, the band melds both with class and grace. I'll give it a B+.